Olympiacos Piraeus continues to add to a most impressive run with its third Final Four appearance in four years, but unlike the first time that happened, in the 1990s, the Reds already have two Euroleague titles to show for this generation's efforts. For its last two Final Fours – Istanbul in 2012, and London in 2013 – Olympiacos arrived as an underdog, but both times returned home carrying the trophy. No longer the underdogs, the Reds will attempt to do in Madrid what only one other club has done during the Final Four era and just four clubs have done in almost six decades of continental championships – to win three titles in four years. Olympiacos is the only team that won its playoffs series this season without home-court advantage, and also the only team that won its series after losing Game 1. It did so behind its Euroleague-best defense, which allowed the fewest points in the competition while proving equally tough on opposing offenses whether on the perimeter or close to the rim. The team cruised through the regular season and won eight of the first nine games in the Top 16 before an injury to star guard and former Euroleague MVP Vassilis Spanoulis slowed things down. The Reds were left without home-court advantage in the playoffs, and lost the series opener in Barcelona. However, they bounced right back behind team captain Georgios Printezis in Game 2, leading from start to finish en route to a 63-76 victory. The series then moved to Piraeus, where Olympiacos had not lost a playoff game since 2011. 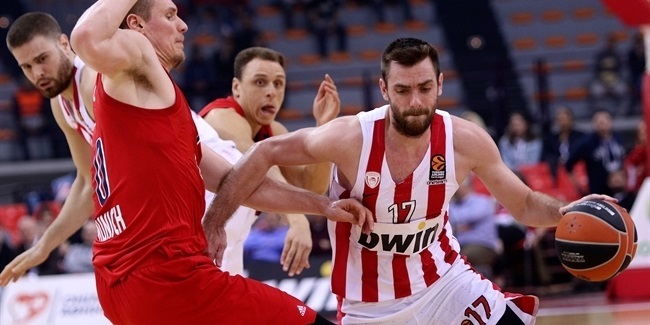 In a dramatic Game 3, Olympiacos held on to win a 73-71 decision with Printezis and Spanoulis in main roles. The Reds then closed out the series in thrilling fashion in Game 4 by rallying from a double-digit deficit before Printezis hit a buzzer-beating triple for a 71-68 victory. It provided for one of the most memorable finishes in playoffs history and sent Olympiacos back to the Final Four! Having won its last four games at Final Fours, and with five players still on the roster from its back-to-back titles, Olympiacos is now aiming for another climb to the top of the podium, which would make it a true Euroleague dynasty. Olympiacos needed overtime to down Neptunas Klaipeda, as Vassilis Spanoulis led the way with a career-high 34 points, 5 rebounds and 6 assists. Kostas Sloukas added 13 points and the Reds won 81-85. 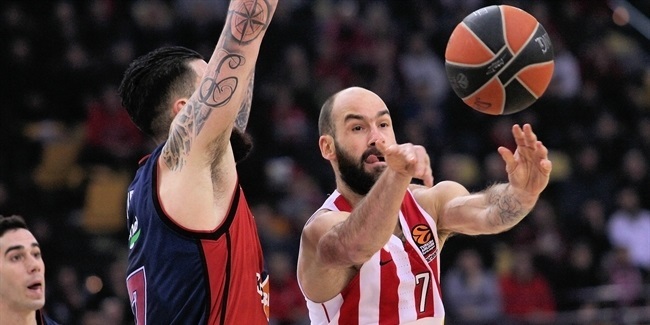 In a battle of Euroleague heavyweights, Olympiacos defeated CSKA 84-76 in front of 11,500 fans. Spanoulis led the way with 19 points, Matt Lojeski added 13 and Bryant Duntson pulled down 11 rebounds. Despite playing without three injured regulars, Olympiacos punched its ticket to the playoffs by downing Anadolu Efes Istanbul 86-75. Oliver Lafayette shined with 17 points while Georgios Printezis had 15. After an underwhelming Game 1, Olympiacos showed its full potential against FC Barcelona, winning all four quarters on its way to a series-changing 63-76 road win. Printezis had 22 points and 9 rebounds. 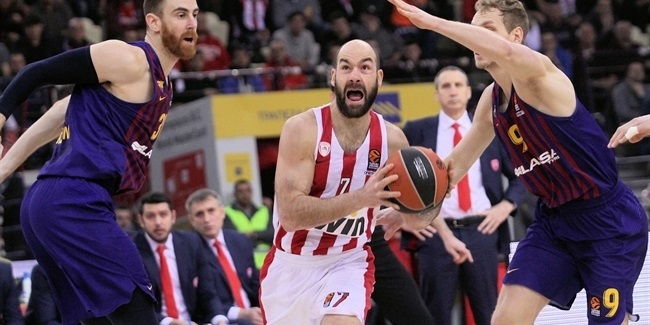 With the game tied at 68-68, Spanoulis passed out of a double-team, then Sloukas sent a no-look extra assist to Printezis, who detonated a three-pointer which sent Olympiacos to the Final Four, 71-68.